According to a report from TransUnion, a vast majority (approximately 68 percent) of patients with bills of $500 or less during 2016 did not pay the full statement balance within the calendar year. That's up from 53 percent in 2015 and 49 percent the year prior. In another report from Crowe RCA Benchmarking Analysis, researchers uncovered that true-self pay patients, those who are responsible for all healthcare costs, generally paid about 6.06 percent on the dollar, while patients who owed out-of-pocket costs after their insurance plan paid about 15.51 percent overall. According to InstaMed’s Trends in Patient Payment, 73% of providers report that it takes one month or longer to collect from a patient. How much of your AR is over 60, 90 or even 120 days outstanding? Are you monitoring the right metrics to really understand the financial health of your practice? For example, do you know what your Net Collections Rate (NCR) is? You could have a significant portion of your revenue sitting in collections and not even know it. We have recently been working with one practice that was writing off 3.9% of their net revenue to bad debt every year. That equated to approximately $500,000 in cash opportunity from elective services they were foregoing. After implementing MedEvolve Practice Analytics, and some additional investment in technology allowing them to capture the patient liability at the point and prior to service, they were able to resolve the issue. We all know you can’t solve a problem if you don’t know there is one to begin with. Monitoring the right key performance indicators (KPIs) is necessary to understanding how successful your practice is at managing patient collections and finances in general. Having an analytics solution will make it easy for you to know how you’re doing. If you see an issue you will be able to address it right away, potentially preventing significant loss of revenue. Make sure your practice has technology in place that gives you these numbers to monitor daily. We can’t walk into a store and walk out with merchandise without paying for it, so should we allow patients to leave the practice without paying? Providers need to start thinking more like a retail business, or even a dentist. Dentist offices are generally really good at up-front collections at the time of service. They typically will provide a treatment plan and estimate the cost up front, putting the decision in the patients’ hands. If it is a serious problem, the patient may choose to do the treatment today, but if not, they may decide to schedule an appointment for next month, or even hold off until next year. This is a better business practice then assuming the patient can pay, or will be willing to pay, after the treatment has been completed. 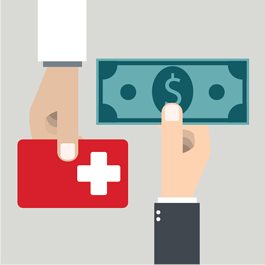 If a patient can’t afford a visit, a best practice would be to offer a payment plan over a reasonable period of time based on the total outstanding business. Using a credit card on file solution, gives you the option to auto debit that card each month. Make this a standard practice and outline it in your patient financial policy. Have your patients sign it and agree to it. Another option is to give them access to healthcare financial institutions, like CareCredit®. They often have promotional offers with 0% interest for a certain amount of time for first time customers. Check eligibility before a patient’s appointment. If you identify an issue with a patient’s insurance, notify them right away. If it’s not an urgent appointment, consider rescheduling for a time when the insurance problem can be resolved. Inform patients of their financial responsibility up front, ideally when they make the appointment. Using an estimator tool will give you easy access to this information. Provide payment options, including payment plans, in advance of the appointment, and worst case when it’s over. Collect on balances due (current and past) at the time of service. You should provide an opportunity to pay prior to the appointment and during checkout. Keep a secure credit card on file for all patients, and update your financial policy to clearly explain financial expectations. Institute a minimum payment due as part of the policy. Consider not scheduling patients for future visits until their prior balances are resolved, or at least on a payment plan. We are in the business of healthcare now and have to treat it like one. The bottom line is, we can no longer rely on the processes of the past—sending a bill and collecting on the back-end. It’s what happens prior to and during the patient visit that has become the most critical part of the revenue cycle. Your staff should be dedicated to better handling the front-end work, like checking eligibility, providing treatment estimates and collecting balances up-front or at the time of service. If you are not in a position to hire the staff to provide this extra dedication to the front-end work, you may want to consider outsourcing some back-end revenue cycle work so you can focus more on the critical front end activities that maximize your reimbursement. Outsourcing tasks like following up on denials and rejections, or patient collections could allow your staff to refocus their attention on the part that matters most. Have you adapted your processes to account for the change in reimbursement? If not, you need to make adjustments to your processes and technology now before patient debt becomes a problem. If all this seems too daunting, it may be time to outsource. Let's have a conversation about how you can do it all successfully–with a little help.